This past Friday night, I had a few of my girlfriends over for some wine, Pinterest recipes and girl talk! (After a long week, is there anything better than night with the girls? I can't think of anything! ;). As a girly girl, I was so excited to break out all of my favorites - pink plates, frosted cookies, fun wine glasses and a new mimosa scented candle. What's a girls night without a little something sweet?! Now, I do understand that there are some out there that aren't huge "sweet people". However, I would say that personally I love sweets enough for two so bring them on! This past weekend when we met up, I grabbed the frosted cookies from the deli (#timecrunch). However, if you have more time to prepare something - get festive! Easter is soon so maybe decorating some cupcakes in Easter/spring colors would be fun. Is a chilled glass of rosé more your speed? (I'm right there with you on a nice spring/summer afternoon!) This rosé was recommended to me by a local liquor store and I haven't looked back since. Coming in under $10 - that part doesn't hurt either! In my opinion, candles bring together the atmosphere of a room. A subtle, pleasant scent swirling through the air can only bring a smile across the faces of your guests. One of my favorite lines of candles are Rewined candles. Well sure, we could all eat sweets all night long. But after I while you'll more than likely start to crave something a little salty and savory. I made sure to make those accommodations this past weekend when I invited everyone over! For this instance, I cooked up a brie dip for everyone. I was amazed at how simple this was to prepare! Not to mention the taste did not disappoint. I don't think there was any leftover after we devoured the skillet. This is kind of a given on girls night ;). 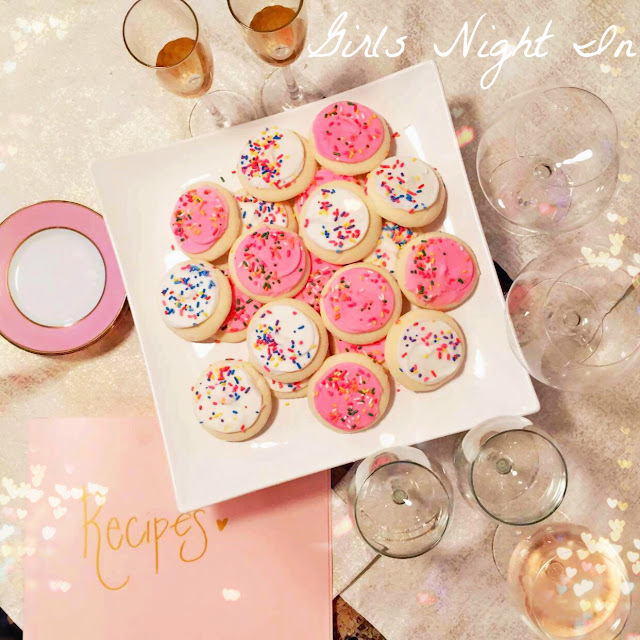 But gather all your girls for some sweet treats, sips and girl talk! There's no better way to unwind at the end of a week! Give me prosecco any day- and garlic dip with baked Brie? HEAVEN. I think the same thing, Ashley! Man I found your blog at the perfect time - Friday night here in Australia! I'm about to set aside a couple of hours to watch a show/movie and eat some cake waiting in the fridge :D and do it again on Sat night too perhaps! I'm happy to hear it! Cheers to the weekend, Vivi!